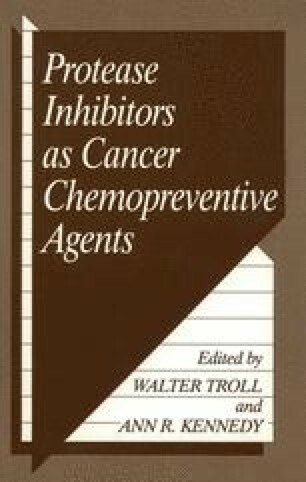 As discussed in several chapters of this book, support for an active role of proteases and protease inhibitors in carcinogenesis and anticarcinogenesis has come from multiple observations that protease inhibitors suppress transformation in vitro and in several animal models (Belman and Garte, 1985; Troll and Wiesner, 1984; Corasanti et al., 1982; Kennedy and Little, 1978; Yavelow et al., 1983). Treatment of various cells and tissues with phorbol ester tumor promoters induces proteases including plasminogen activator (Quigley, 1979), and the promoting activity of phorbol ester is inhibited by protease inhibitors in vivo and in vitro (see Belman and Garte, 1985, for review). The mechanism of action of protease inhibitors as anticarcinogens is not well understood, and is probably complex. We thought it would be of interest to determine whether such agents could affect transformation of cells caused by a single purified activated oncogene, as opposed to radiation or chemical carcinogens. We therefore adapted the standard NIH3T3 transfection focus assay with an activated human H-ras oncogene to assess the effects of protease inhibitors (and other chemopreventive agents) on oncogene-induced cell transformation.